Dallas Seavey takes his 16-hour mandatory rest in Neiden. Thomas Wærner now has a chance to take the lead in this race. There was much excitement around Neiden earlier today. Would Dallas Seavey hit the trail after a couple of hours, or would he take his 16-hour rest here? He is chased by Thomas Wærner, the man many experts consider the main competitor for Seavey in this year’s FL-1200 race. Wærner took his 16-hour rest in Tana, leaving the checkpoint at 14:48 CET with 13 dogs in front of his sled. 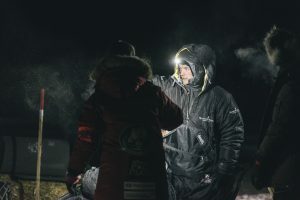 Dallas Seavey chose to take his 16-hour rest in Neiden and can leave the checkpoint at 02:40 CET. Our expert Trond Ørslien believes Seavey will continue to rest his dogs in the current phase of the race. He believes the American holds a firm grip on the top position in the race and that he will mush rather conservatively in the coming days. – Dallas Seavey now demonstrates his skills in Finnmarksløpet and shows why he is the best long distance musher in the world. The way he organizes his race, he will be able to race non-stop for a long time towards the end of the race without losing much speed. He may even cover several legs in one, Ørslien predicts. The question then, of course, is what Thomas Wærner plans to do. Will he race the traditional way, from checkpoint to checkpoint, or does he hold cards up his sleeve that he hasn’t shown yet? – Wærner took his 16-hour rest early. He knows the race better than Seavey. These two factors may be an advantage for him, but we do not know yet, says Ørslien. It will be incredibly exciting to see what these two are up to during the next 24 hours! – Many are curious as to Seavey’s tactics. It may appear as if he is taking long-distance mushing to the next level. But the race is far from over yet and it is hard to predict anything at all, Trond Ørslien emphasizes. Finnmarksløpet has reporter Nina Skramstad at checkpoint Neiden at the time of writing, together with photographer Reidar Arnesen. The two will provide running updates on our Facebook page. In the FL-500 race, Harald Tunheim has accrued a solid lead. Not even an unscheduled mating episode among two of his dogs on leaving Karasjok could stop the veteran who holds a track record of five wins in the [previous] FL-1000 class. It will take a lot to prevent him from taking his first FL-500 victory now. Tunheim is expected at the finish line in Alta around 07:30 Tuesday morning CET (22:30 hrs AKDT Monday night). His nearest competitor is 2014 FL-500 winner Ronny Wingren, who nevertheless left cp Karasjok one hour and 32 minutes after Tunheim.